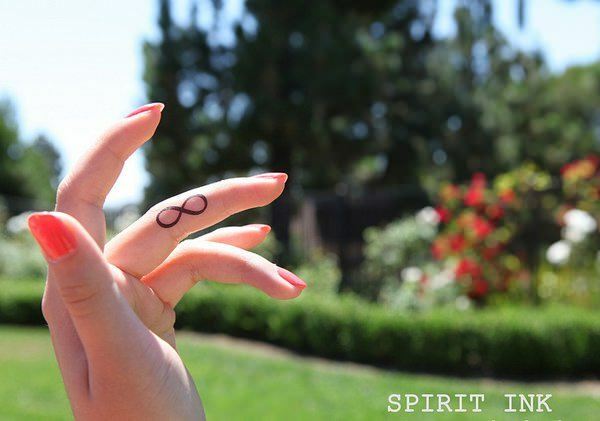 We’re aware of the significance of the infinity sign – that of never-ending balance and the delights of opposites. 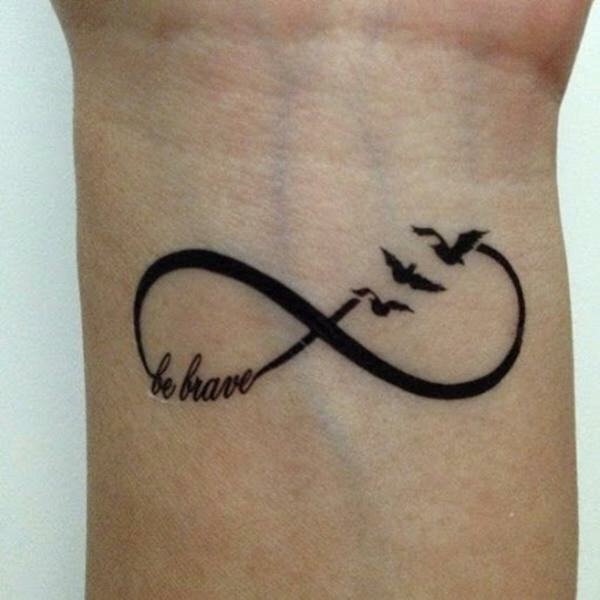 But for every individual, it can take on its own meaning and play its own significance in the wearer’s life. 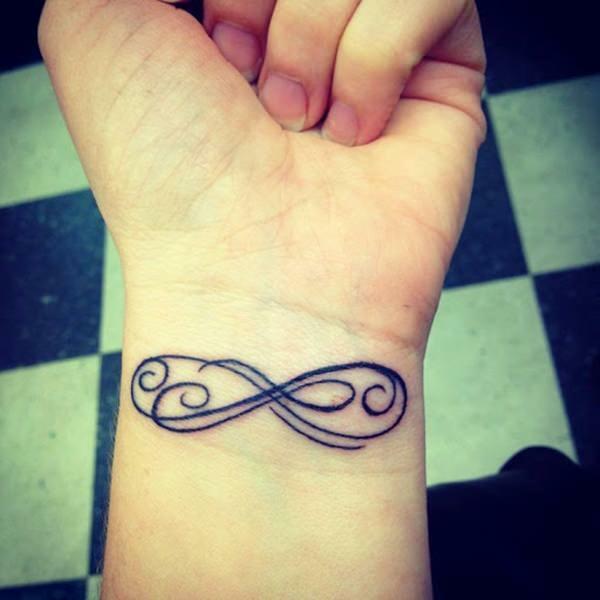 If you’re considering this universal symbol as a possible tattoo, take a look at these striking infinity tattoos artists inked up to get an idea at how creative or how simple the infinity tattoo design can become. 1. Memorable Phrases & Balance of Opposites. Remembering that special day was never so easy. 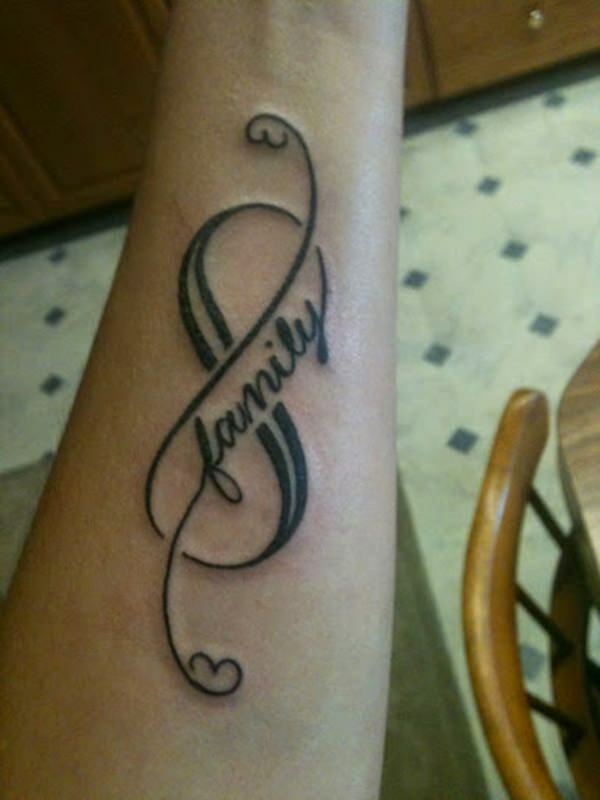 If you forget, you can just take a look at your tattoo. Unique and easy to comprehend. 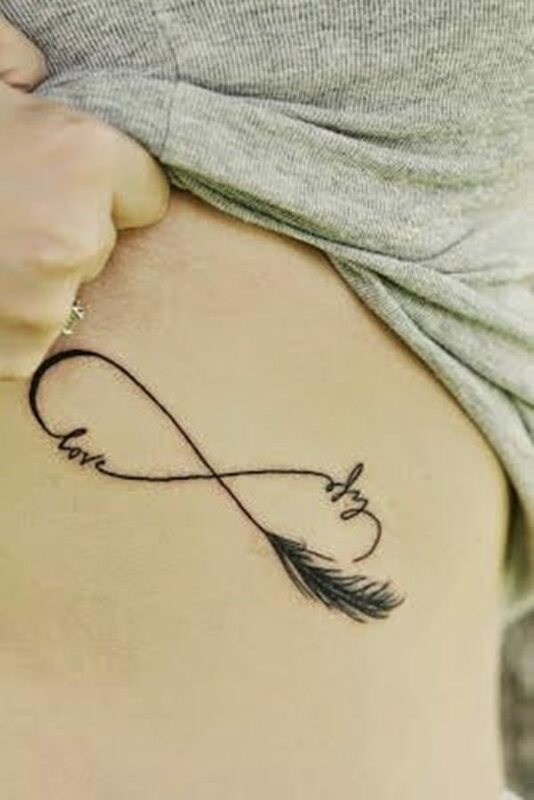 If you’re an outdoors lover or are transfixed on tribal or Native American décor and art, it can be fun to create your own infinity sign out of different symbols. 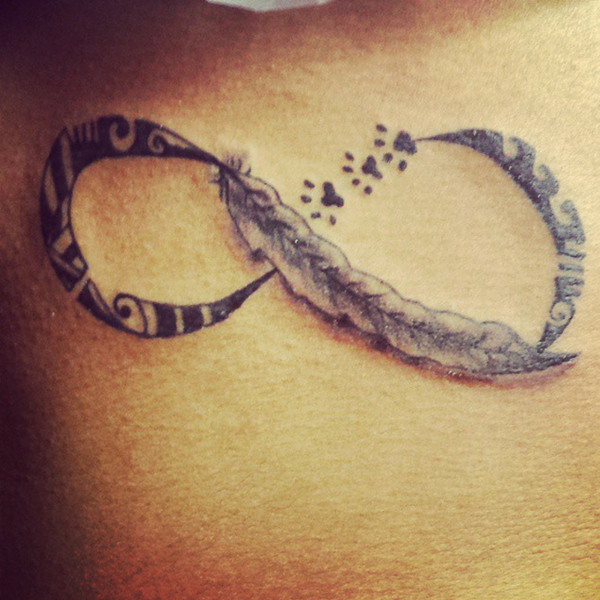 A feather, for freedom, paw prints, for following the right path, and tribal designs for everything in between. 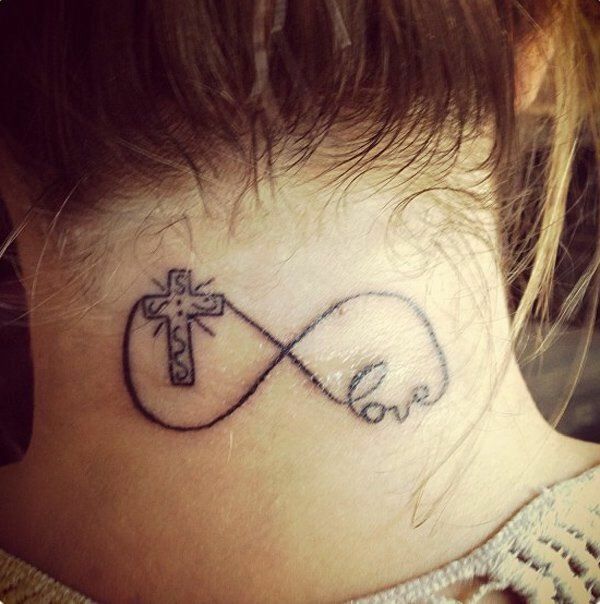 This is a creative design, incorporating an anchor into the actual infinity symbol. 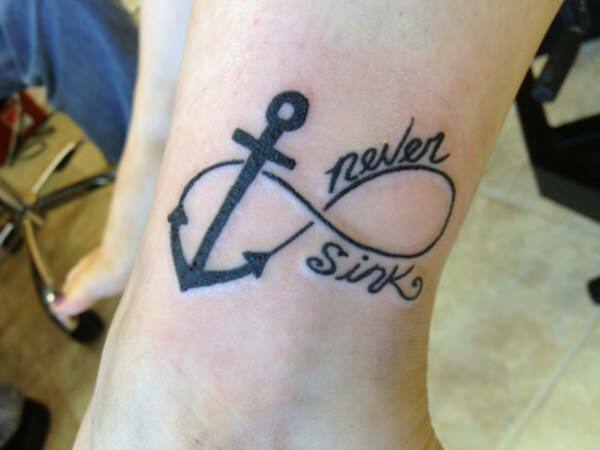 “Never Sink” might have been an inspiring quote told to the wearer by a loved one. 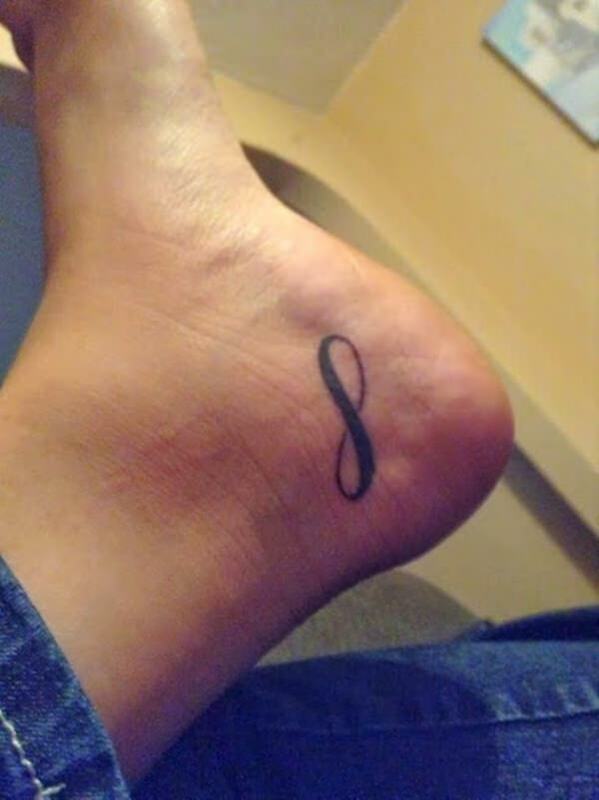 Infinity tattoos are a great choice for couples that want to get a matching tattoo but don’t want it to be too horribly personal, such as a name or pictures. 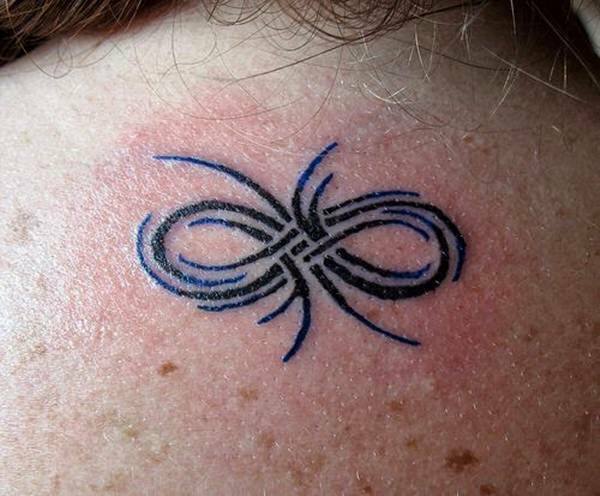 Infinity symbols can be placed on the same spot on the body by both people in the couple – and yet they don’t have to match exactly. This person really loved pizza. They must have a sense of humor. 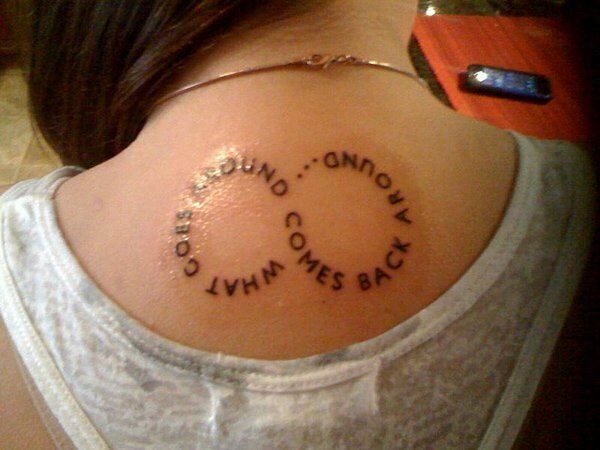 The nape of the neck is often mentioned in romantic novels and the like, a sensual place that begs to be touched. 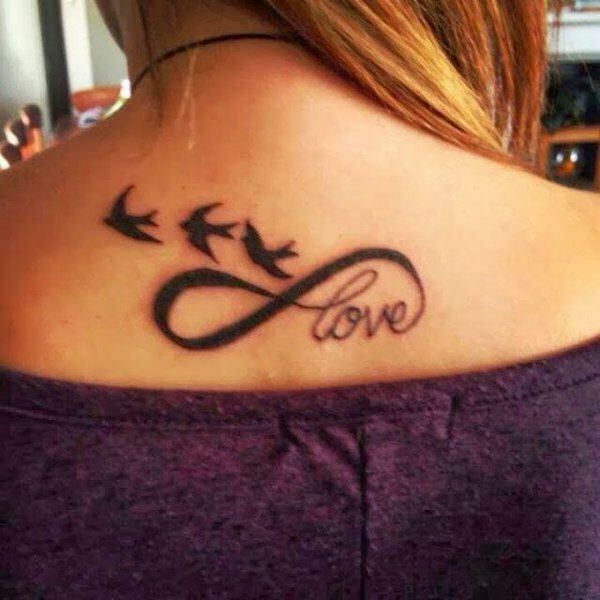 Adding a tat to this part of the body only brings more attention to it – and the line of Roman numerals down the spine draws your attention up to the infinity sign. 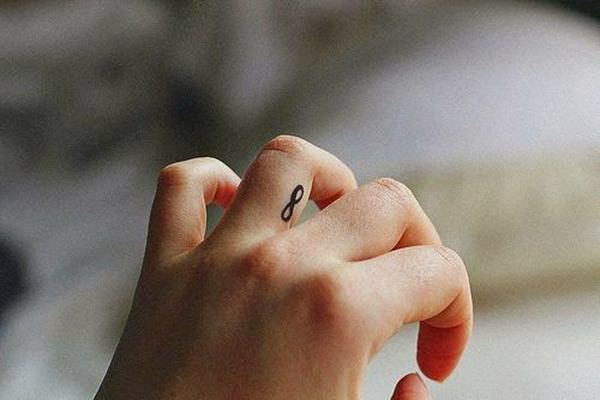 A perfect combo – like the numbers of counting time finally end (or never end) at infinity. 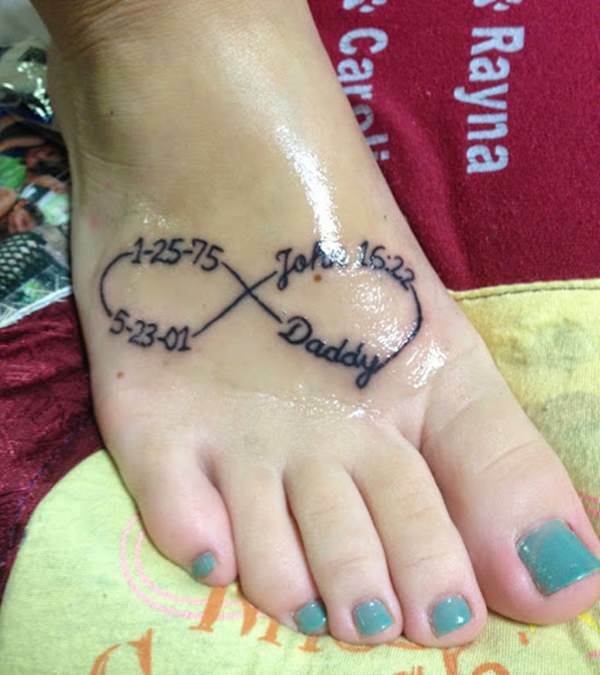 This tat is a perfect example of how you can commemorate a piece of your skin to your family. 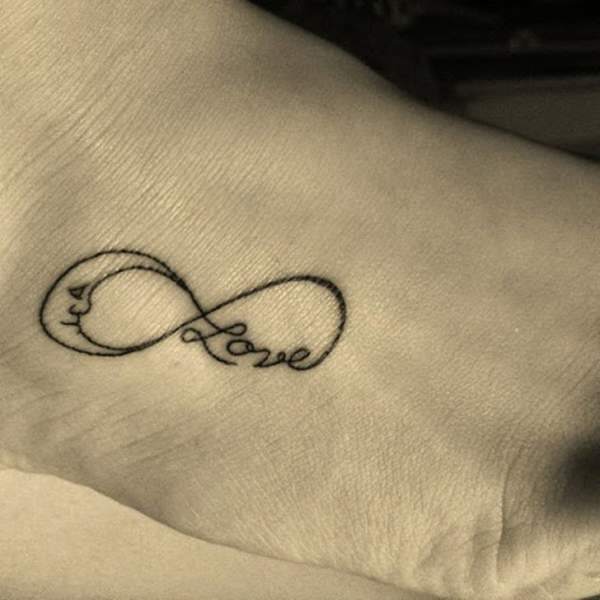 Infinity tattoos are often used to symbolize love for those we want to keep in our hearts forever. 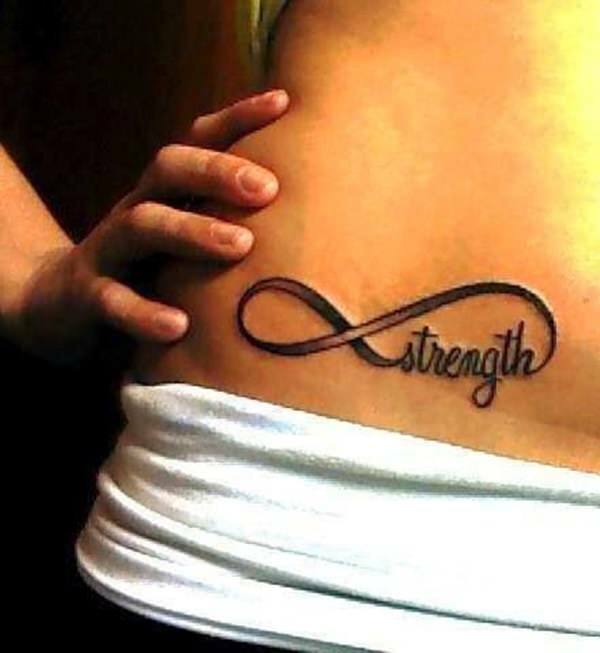 This infinity symbol looks strikingly like a ribbon, and the word strength adds to the assumption that this tat is meant to remember someone for a ribbon-like cause (such as the pink ribbon for cancer). 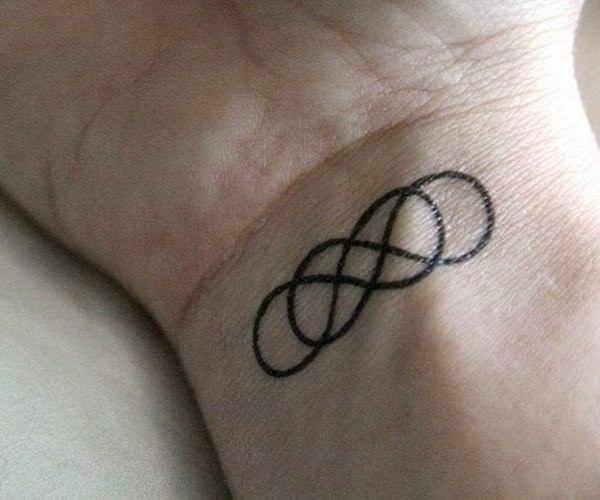 Infinity tattoos can sometimes be hard to spot or interpret. 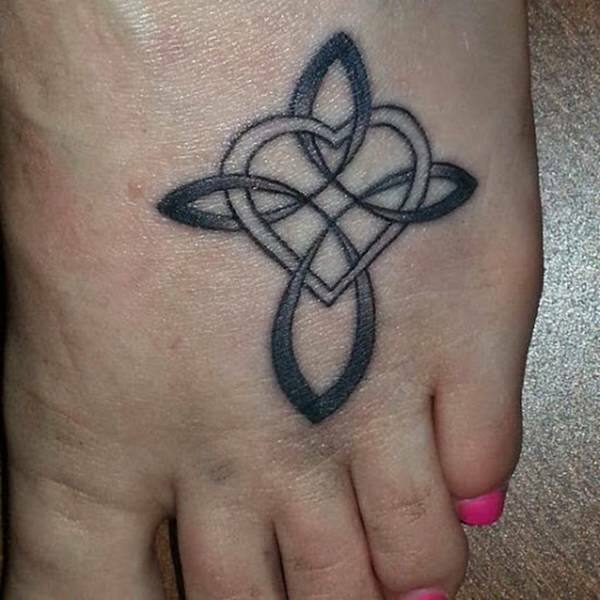 This looks like a combination of two infinity signs and a Celtic knot. 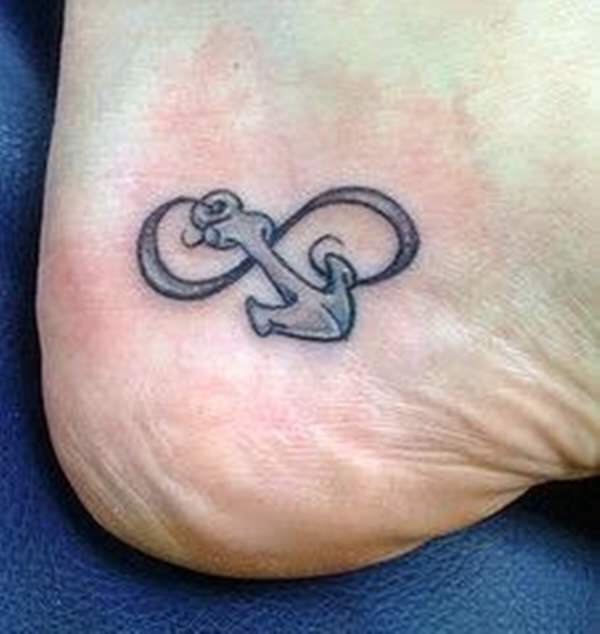 Another cute nautical infinity sign delicately placed on the heel of a foot. 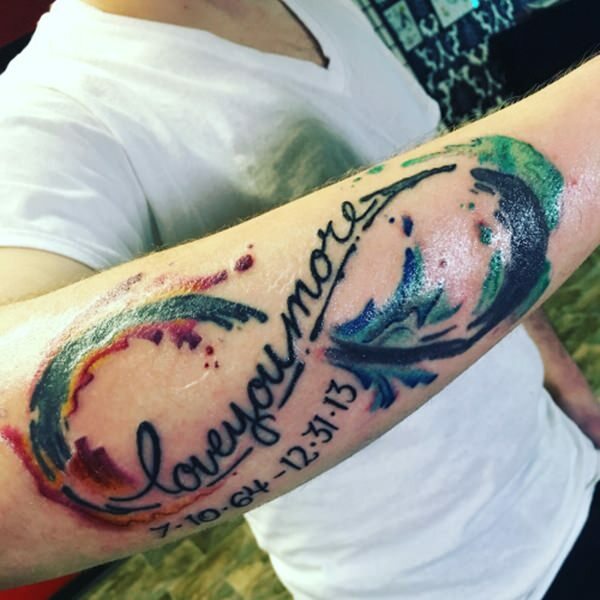 In remembrance of a loved one. 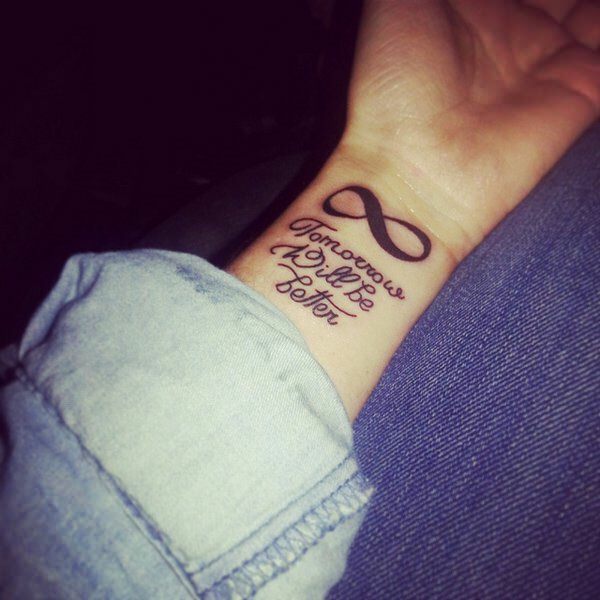 Tats stick with you forever, and dedicating a tattoo to a loved one, especially one that’s passed, is a good way to not only keep their memory on your skin but in your heart. 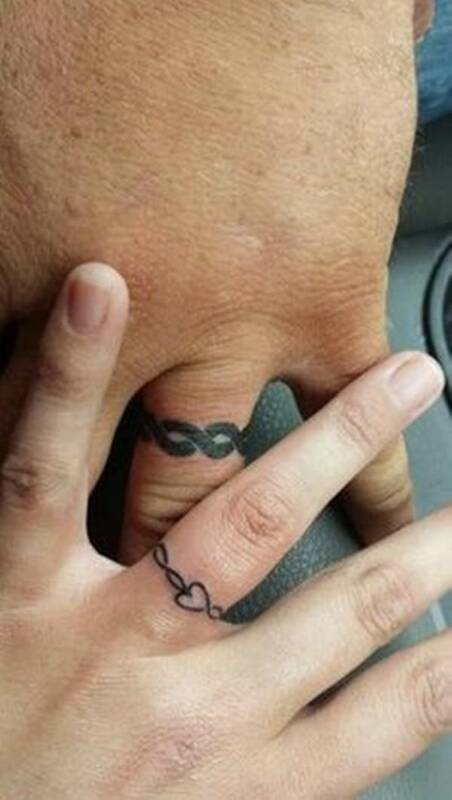 These two infinity signs are linked together, a great way to symbolize two people’s paths that will forever cross. Who says you can’t love kids toons in adulthood? 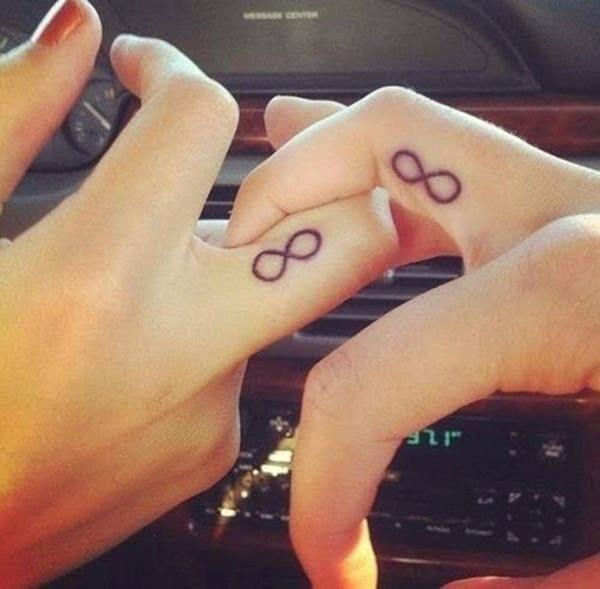 These infinity tattoos are easy and fast to tat, and choosing to get one with a lover or friend can be fun. 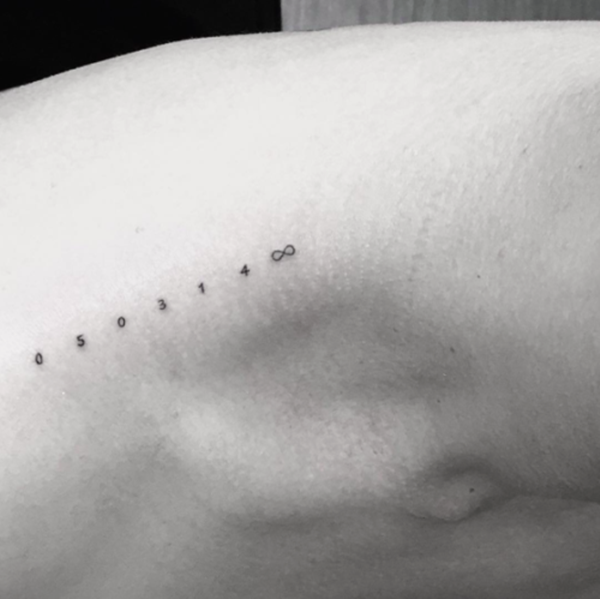 Like a swirling array or either nether or galaxies themselves, infinity tattoos look remarkable when adding delicate, curling lines. 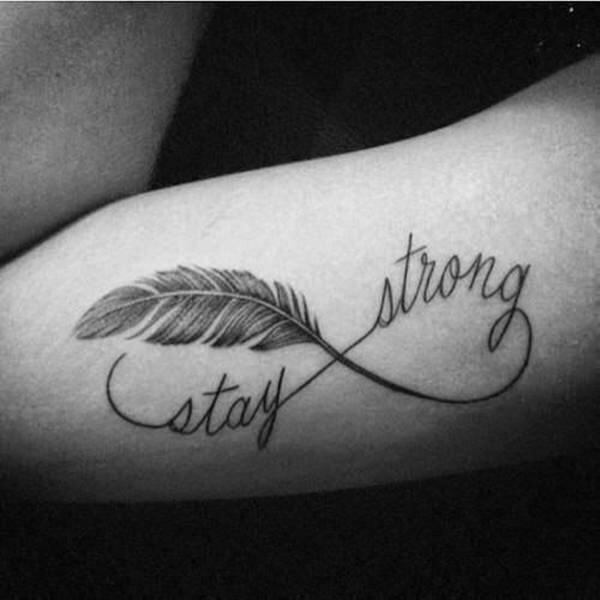 Staying strong is a constant. It’s something we have to do everyday to get by the rough patches in our lives. 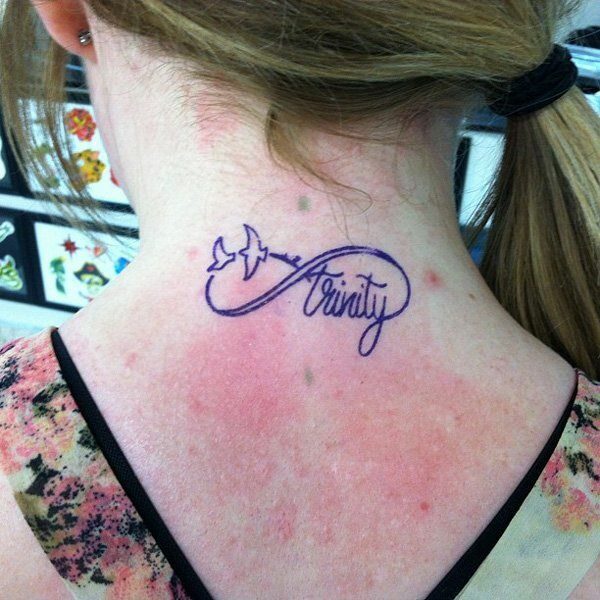 It isn’t surprising a majority of infinity tattoos dictate this. 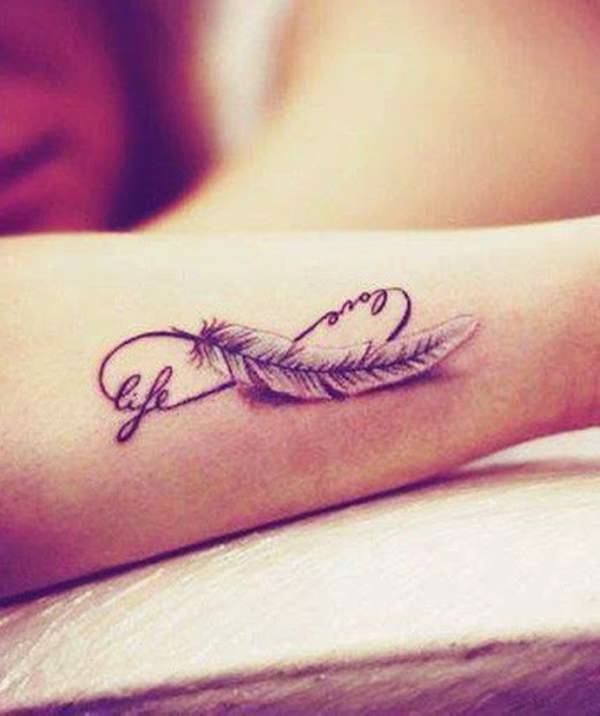 But you can always add your own little design to the words and symbols, like this wearer did with a feather. 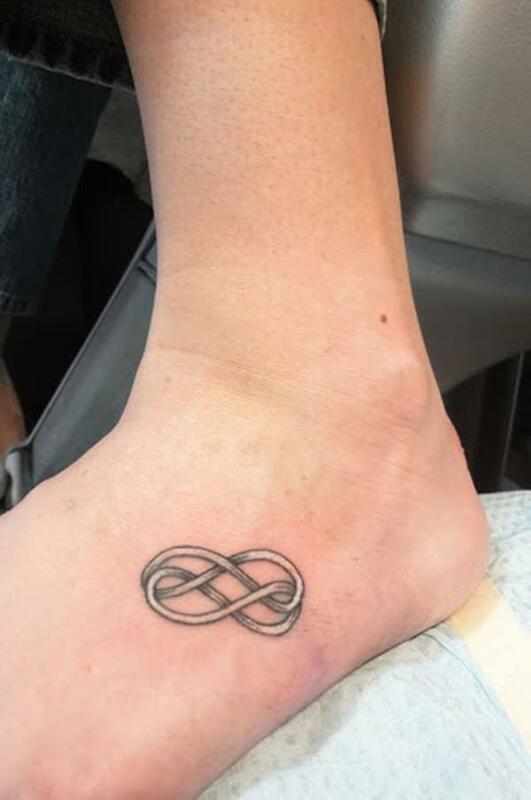 Instead of having two infinity tattoos one above, the other below, this person had them placed side by side and created a lovely diamond in the center. On the heel. Cute and confident. Our roots are a vital part of our personality. 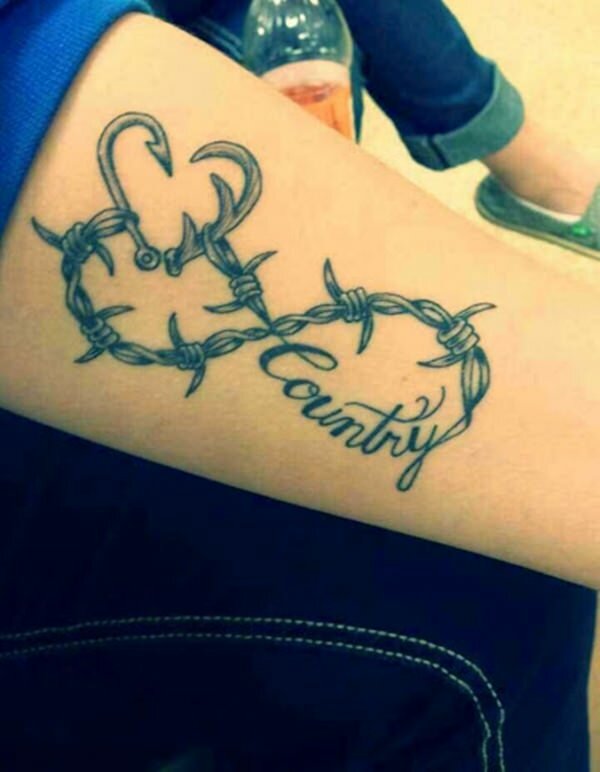 If you’re born country, you’ll more than likely stay country! Religion holds a deep and special place in most hearts still to this day. 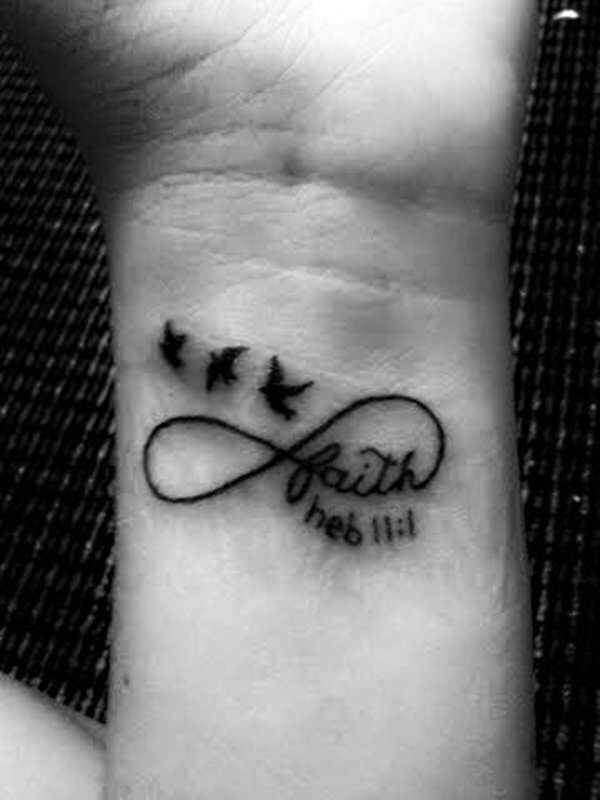 The quote taken from Hebrews 11:1 states “Faith is confidence in what we hope for and assurance about what we do not see.” Brilliant, and perfect when paired with an infinity tattoo. 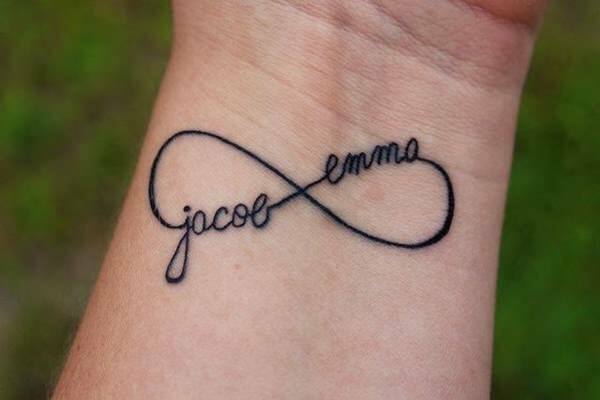 You can have any words you wish wrapped up in your infinity tattoos. 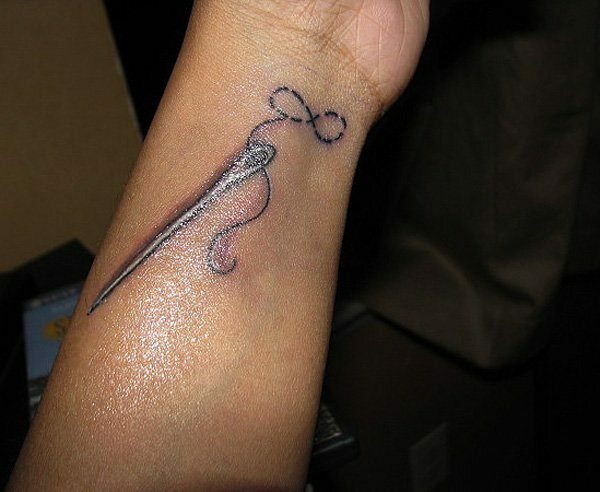 This little tat is often a lot cheaper than a diamond. A pet is a part of your family, after all. 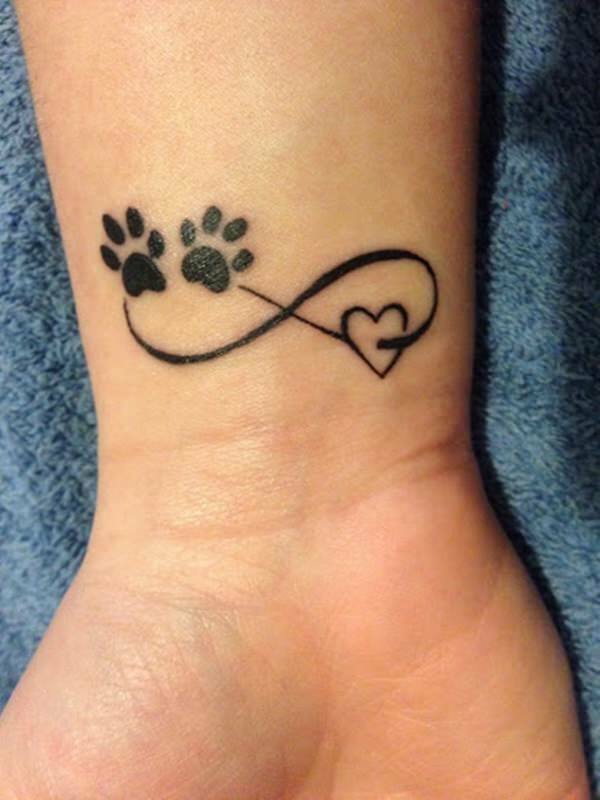 And paw prints are adorable. 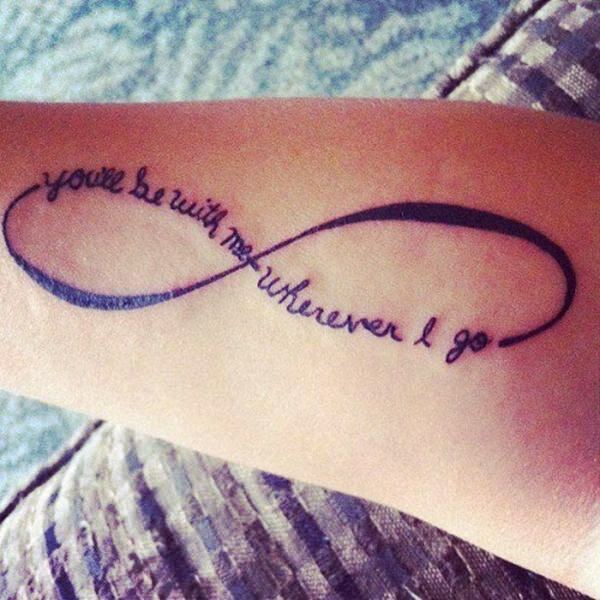 Another common saying paired with the infinity symbol. And for good reason: who doesn’t love life? Those that fail at goals and stop trying? 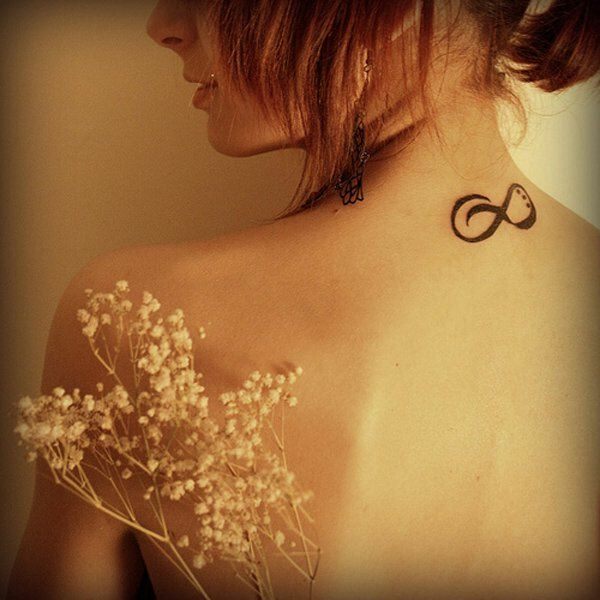 Infinity tattoos incorporating anything celestial are a great idea to consider if you practice a religion that regards such things as divine. 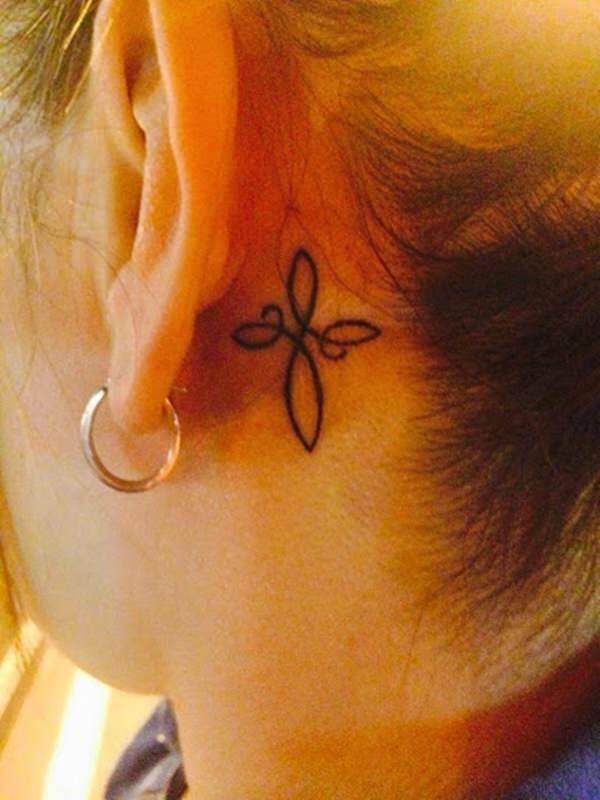 Location is sometimes everything, and behind the ear near where you hear and next to the brain is a significant spot to put a tat. 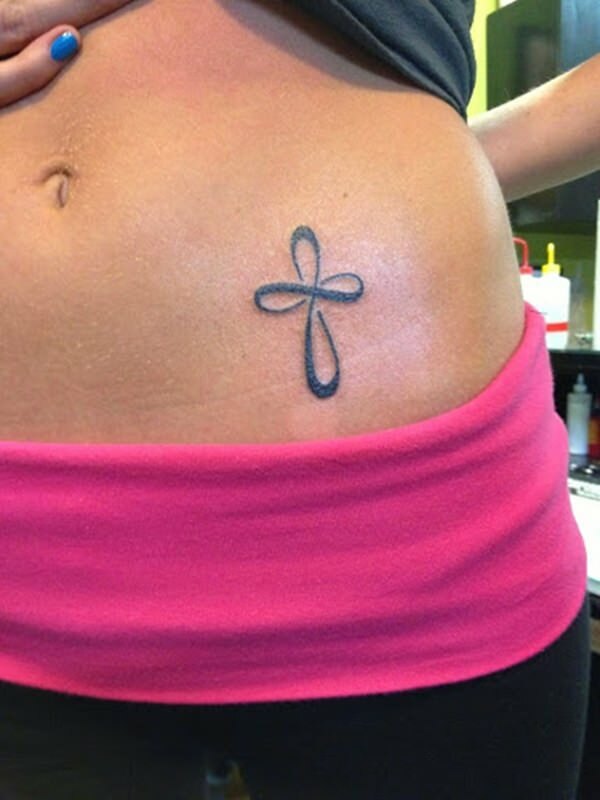 Infinity tattoos can often create something or a symbol bigger than itself – like the cross seen here. 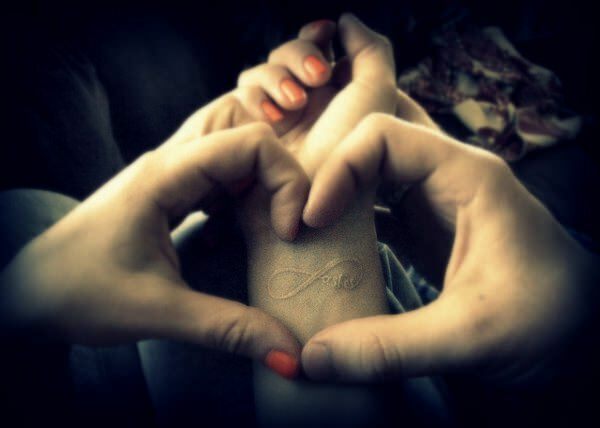 Love should be infinite for those we dedicate our lives to. 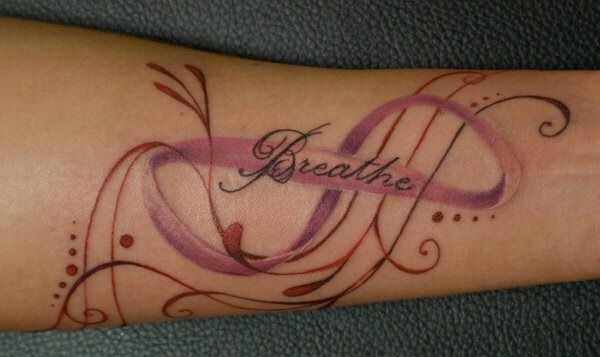 This tat is bigger than you can see, looking like waves and space intermingling. 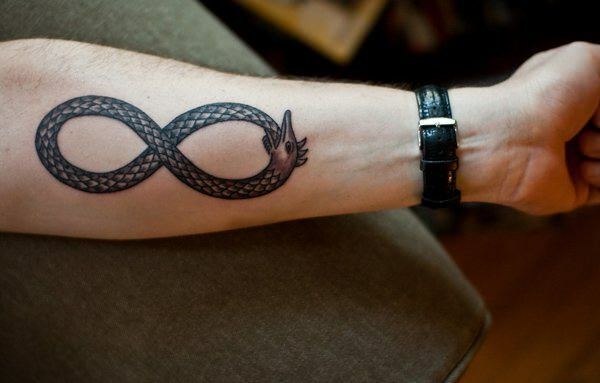 This infinity tattoo is wrapped up loads of symbolism. The eyes wander everywhere searching for meaning, right? 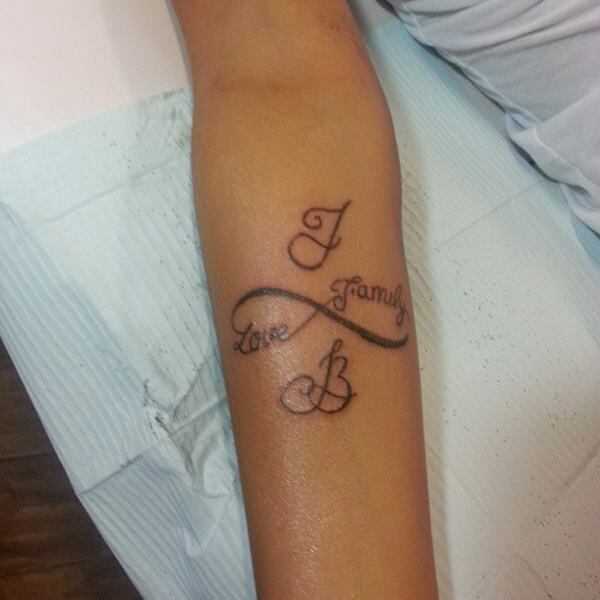 Yes, another family tat with infinity as the main drop. 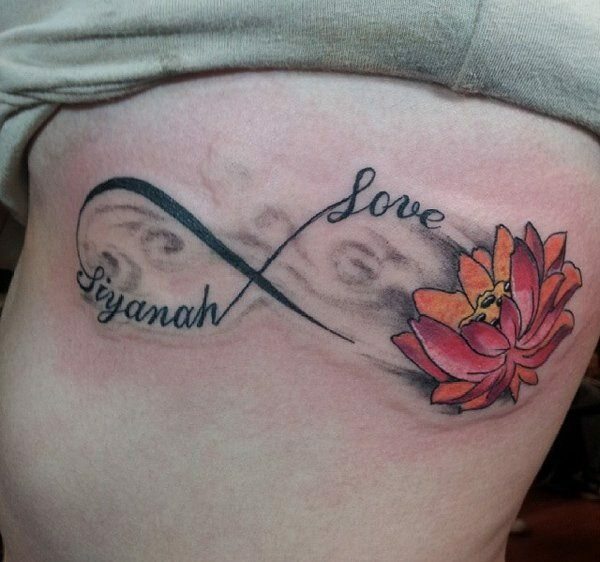 It’s not recommended to get a tat of someone you’re “fallen in love” with because there may be a chance of separating from them… But this person didn’t follow the rules! 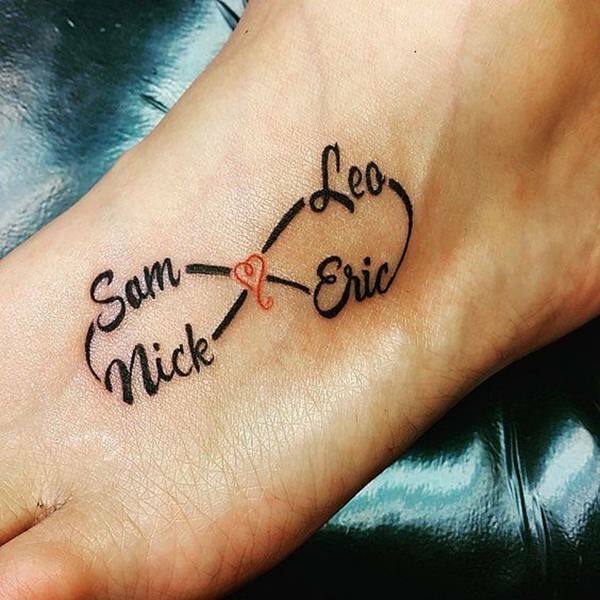 A lovely way to show your love for your sibling. 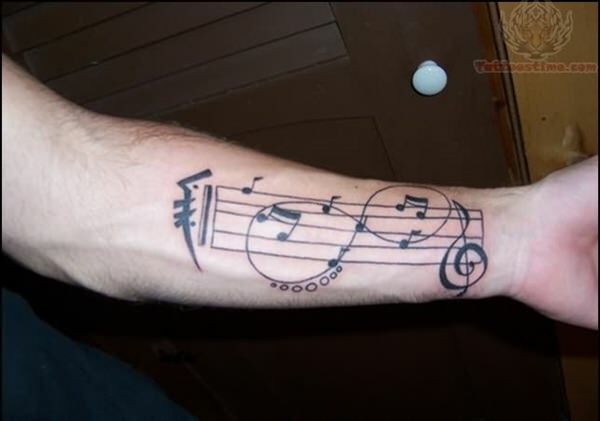 For some of us, music helps us cope. 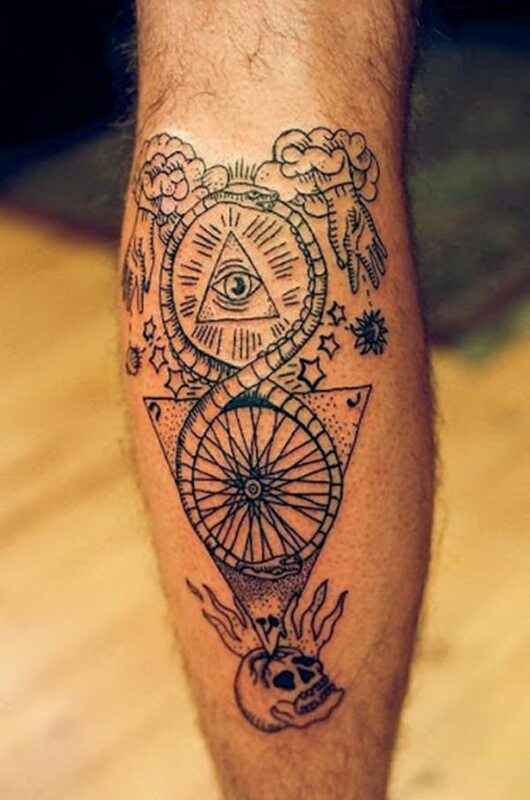 Who needs diamonds when you’ve got tats? 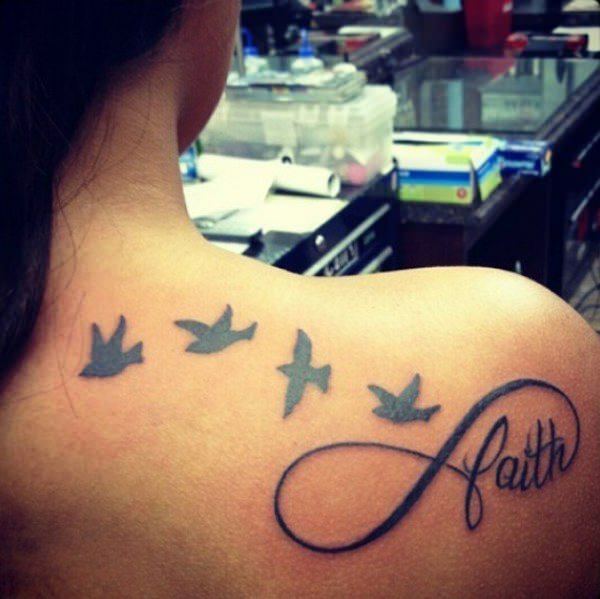 The triad of names is accompanied with two birds… should have been three. 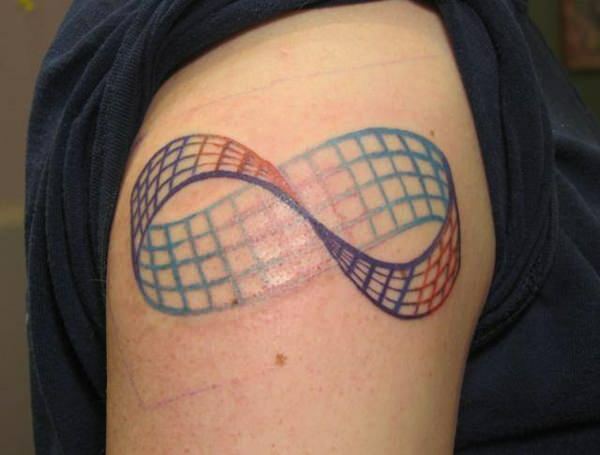 Yes, this is a tat of a stitching of infinity. Kinda cool. 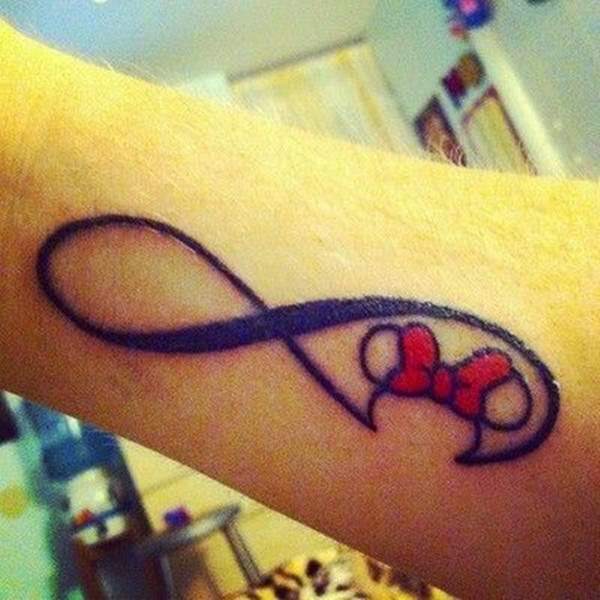 This infinity symbol looks like a ribbon supporting cancer research, a lovely permanent contribution. 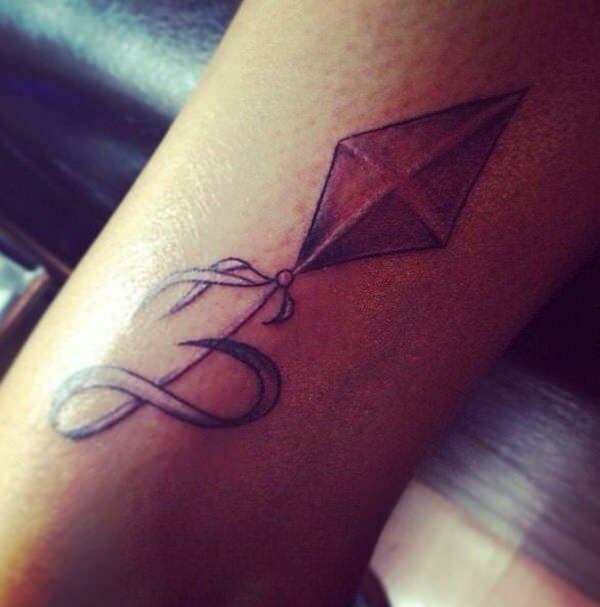 The tail of this kite turns into an infinity symbol. 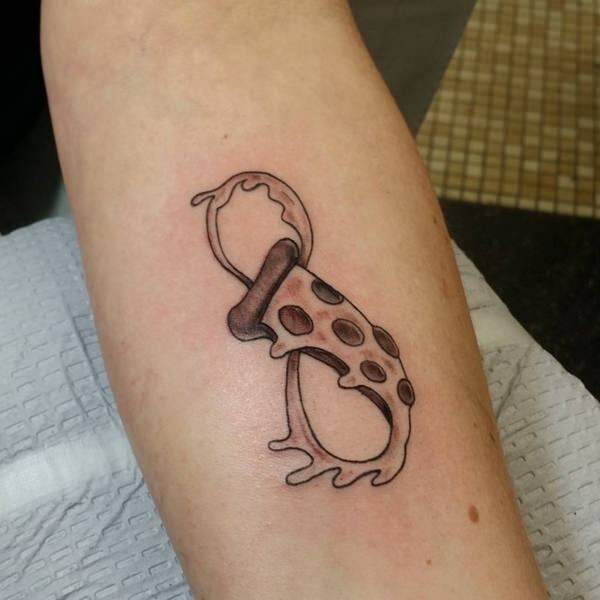 What do you think the wearer was trying to symbolize? 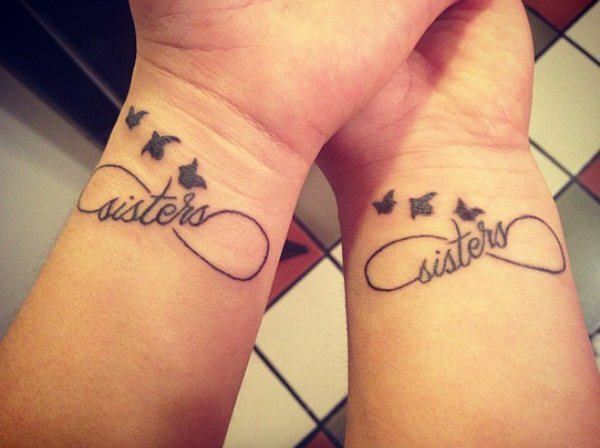 These two different people decided to get tats that complete one another. 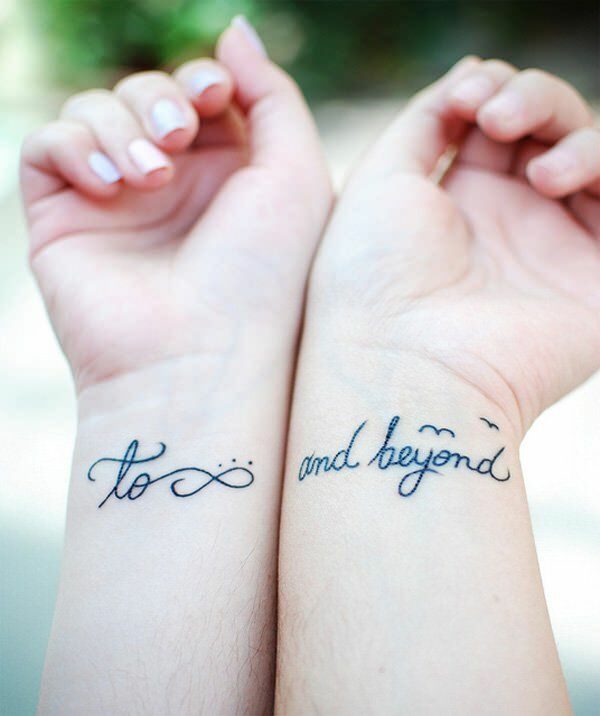 To infinity, and beyond! 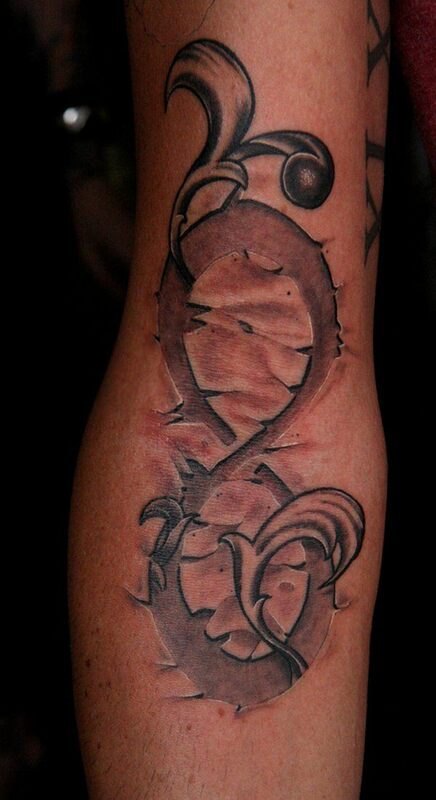 This tat was completed by combining two infinity symbols, both having one side that bulges out more than the other to get the pretty combo effect. 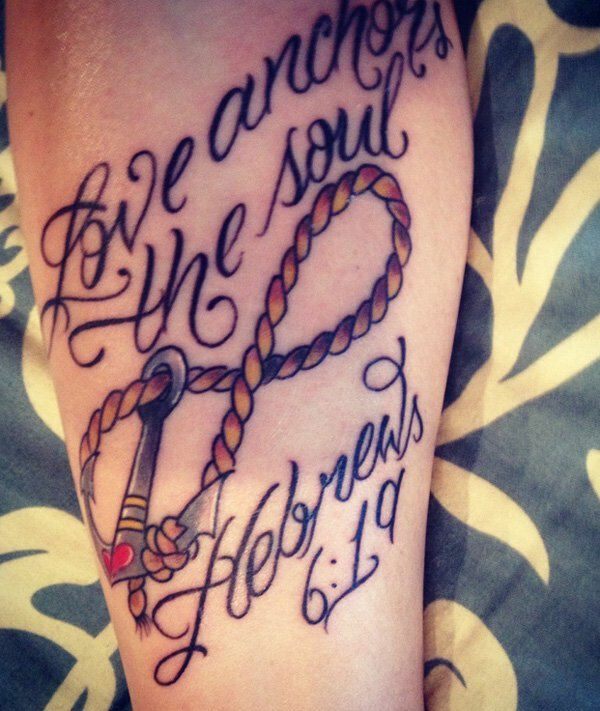 This anchor is combined with rope and roses, swirling elegantly with one another. 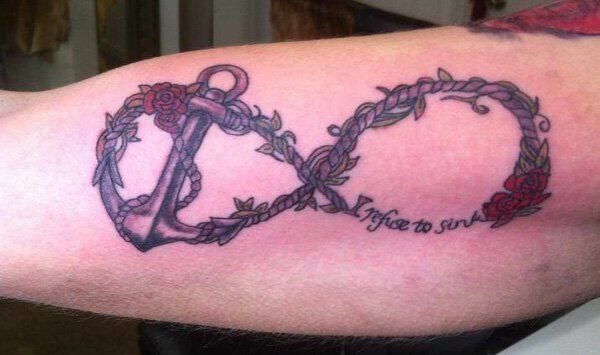 Proclamation of “I Refuse to Sink” well regarded. A beautiful contribution to a beautifully named person. 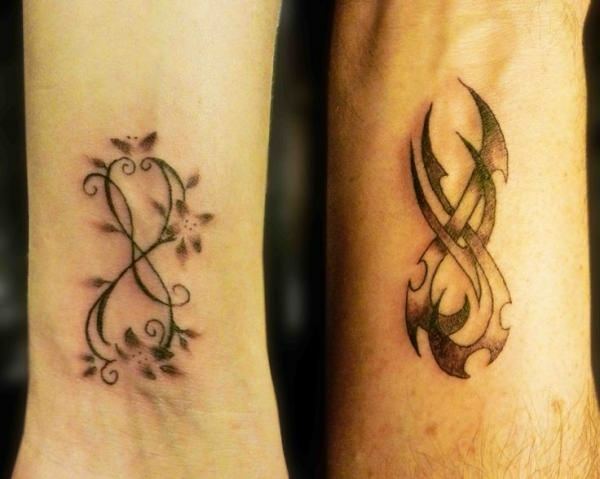 Look like they’ve been branded – pretty awesome and romantic. 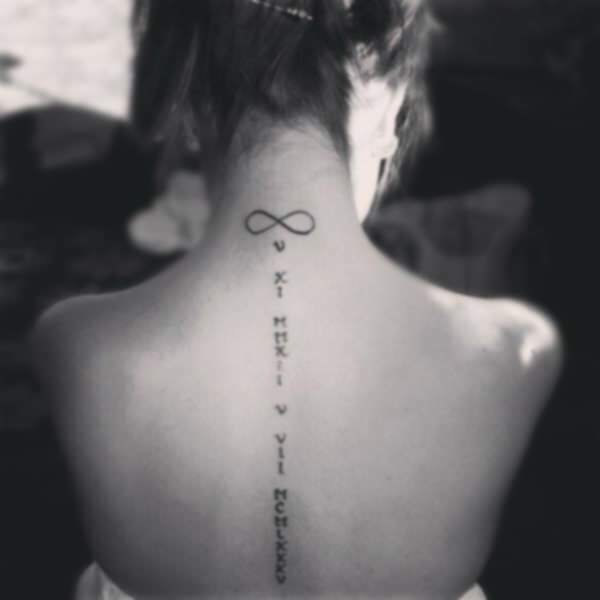 Infinity tattoos many times are linked to religion in someway – to beliefs about the other realms. Its little phrases and quotes like this that can really inspire something within someone. Constantly eating itself. Forever sustaining itself. 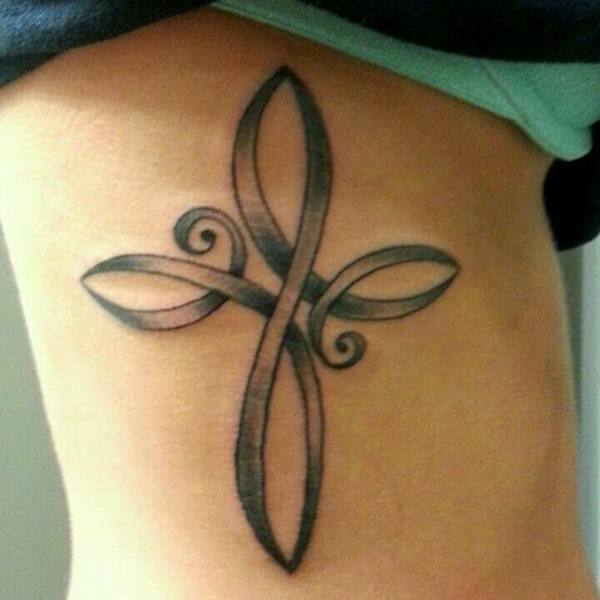 Having Faith can be hard, but it’s doable. Think of all your accomplishments already. All it takes is a glimpse at your finger to dictate where your day is going. Looks like a few crumbs on the ground, as if she’s reaching for cookies on the counter. Infinity looks almost desolate, with hints of life sprouting out of it. 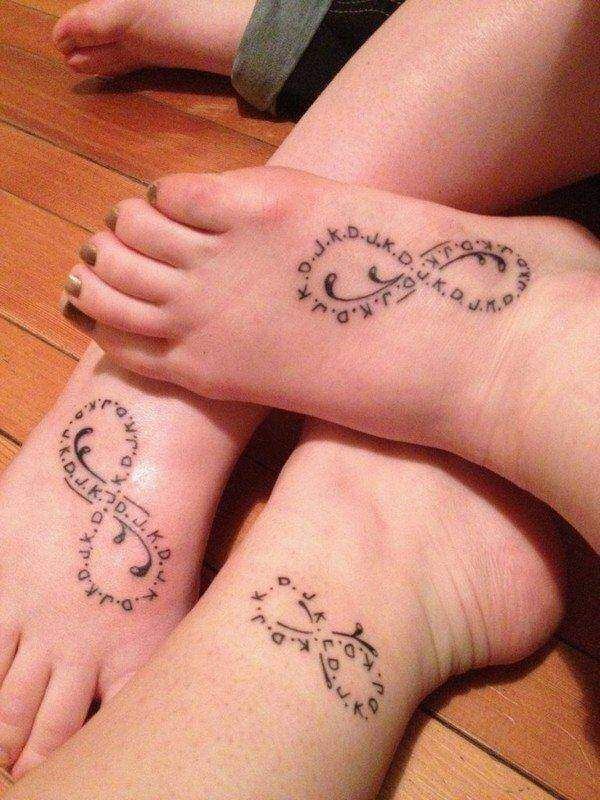 Have you ever seen three people instead of two share the same tattoo? I assume the letters are the initials of the first names. Lovely touch. Another wonderful example of the freedom of birds and reaching goals combined with love. 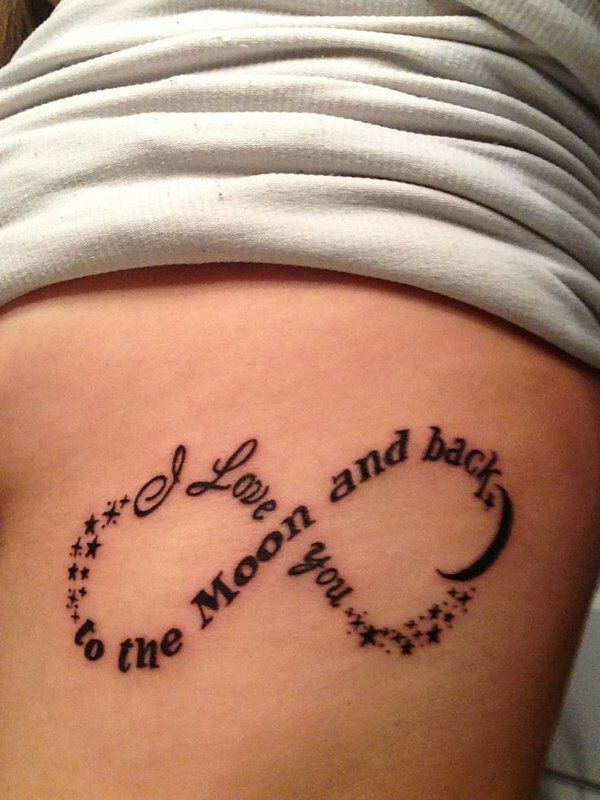 This fabulous ink takes a classic old love quote and combines it with the appropriate attire of the stars and moon. 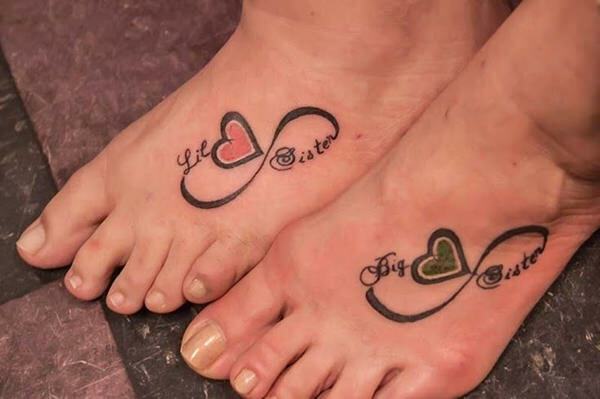 I bet these four people would do anything for each other, even get the same tat on their foot.